DXRacer Boss Series ▷ Size & Buying Guide on GOTURBACK.UK! The DXRacer Boss Series is the definitive of gaming chairs. Designed to provide maximum comfort during the gaming process, the result is a bigger, sturdier chair able to cope with a greater weight distribution. Solid in construction, but without losing any of its ease in feel or movement, this is the popular choice with heavier gamers due to its strong support and extra roomy design. A customer favourite, most reviews of the Boss Series can be summed up in just two words; pure comfort. Those looking for the best in gaming chairs will find the Boss Series hard to beat. For a gaming chair experience that is second to none, the DXRacer Boss Series is one of the more favoured higher specification products on the gaming chair market. The Boss Series individual features are as impressive as the chair itself. Ergonomically designed to support the gamer, the chair has a deep seat base and a tall back rest with built-in head cushioning. The aim of this chair is to support player posture, that of the spine while offering stability. With a resilient armrest surface, users can rest their precious gaming arms in between games on its lockable 3D arm rests! The standard hydraulic unit allows the chair to be raised and lowered to suit personal preference through a uniquely designed handle. Not only can the height be adjusted in this chair, so can the angle, with a titling mechanism to further improve positioning allowing a 90 degree to 120 degrees recline in its backrest. The functionality of this chair extends to its base. With a cleverly intended footrest-shaped base, not only does it last longer than more basic designs, but it also increases the comfort of foot placement during gaming. The casters ensure firmness and quietness in movement and are floor friendly. Perhaps though, one of the most important features to many gamers, is the extent of the rocking motion! With rocking possible in any position the seat is set in, the Boss Series really does advance gaming progression. Currently, the DXRacer Boss Series is only available in the colour black. But, for those gamers who choose not to judge a gaming chair by its colour, this colour choice enhances many a room. Most gamers are proud to offer the Boss Series pride of place in their gaming room on looks alone! With a high-quality material such as synthetic leather used in its production, the materials make this chair soft and pleasant to the touch, and its neutral colouring merely enhances those exceptional features. The Boss Series offers users a wider seating space than the average gaming chair. With its extra generous dimensions, this heavy-duty product supports a weight of up to 200kg. This maximum figure ensures that longer periods of sitting allows the user to continue gaming in comfort. 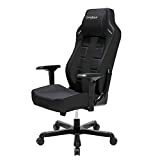 However, the chair not only supports the heavier and broader of users, but it can also provide maximum comfort for those smaller in stature who simply want a more roomer chair whilst reaping the rewards and features this specific gaming chair offers.